A 2014 survey of 120 major retailers polled by Chain Link Research found improved inventory accuracy, which translated into reduced out-of-stock and better on-floor availability of merchandise, was the number-one reason for implementing an RFID inventory control program. According to Su Doyle, former IoT and RFID industry program lead for Checkpoint, several of the company’s apparel retail and department store customers were able to increase on-shelf availability by 20 percent with RFID and experienced a 10 to 15 percent sales uplift for RFID-tagged merchandise. As it relates to omni-channel fulfillment, its customers have reportedly been able to double the fulfillment speed with near-perfect order accuracy when using RFID-enabled process automation. An early proponent of the technology, Bloomingdale’s Vice President of Operations Roger Blazek found the accuracy that RFID delivers to item-level inventory was one of the main driving forces for adoption. “Using RFID to course-correct inventory throughout the year instead of waiting for the annual inventory processes helps retailers make better business decision. The accuracy of the technology also contributes to confidence in the data, which can take a lot of the guesswork out of the equation when planning the next strategic direction,” said Blazek. 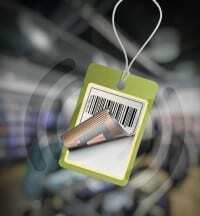 Other prominent use cases for RFID inventory control technology include product location and loss reduction. An emerging business case revolves around lowering on-hand inventory levels while not impacting customer service levels, although this application is in the early stages of adoption. Many times retailers actually have the inventory on-hand, but it is stuck in a backroom, said Kim Melvin, director of global solutions and product marketing for Johnson Controls (formerly Tyco). RFID technology can streamline locating missing inventory through the use of mobile handheld readers, significantly saving both time and money and a potential lost sale. This is particularly important in complex merchandise categories where color and size variations matter most, such as fashion and footwear. “RFID helps us better manage replenishment items and leverage our owned inventory by ensuring that merchandise that is already in our stores is ready and available for purchase, not sitting in a stockroom. Customers expect to find what they are looking for immediately, not wait for an associate to search through back stock to find it,” said Blazek. As it relates to loss reduction, Claude Verville, LPC, former vice president of loss prevention, safety, and hazmat for Lowe’s, believes that RFID is an essential tool for LP teams as well. In many companies, it is the LP team that performs daily, weekly, or monthly cycle counts of high-cost, high-margin, or high-risk merchandise to identify shrink trends and proactively analyze why, what, when, and where the losses are coming from in order to adjust LP, operations, and merchandising strategies. Perhaps one of the biggest understandings to come out of the deployments so far is that RFID is not a one-trick pony. The benefits the technology delivers are cross-functional and cross disciplines and departments. It has the ability to fundamentally change the way retailers operate their businesses. To be effective and successful, RFID inventory control programs and their sponsors need executive level buy-in at the highest level and a commitment from all areas of the company. “Perhaps more than any other technology introduced into retail since the barcode, RFID has the ability to shape and improve the way retailers operate,” said Brian Boyle, RFID business development for Tyco. “From merchandising, store operations, loss prevention, and supply chain to the executive offices, the technology can have a profound impact on the operations given the right level of support from all parties involved.” Boyle went on to emphasize the importance of beginning any RFID inventory control program with a pilot. It is here that the use case or business case is built out and where expected results can be clearly defined. Another key element to implementing a successful program involves managing the volume of data that RFID inventory control produces. Doyle stated that her company works closely with its customers to understand the value the data brings and how to incorporate RFID benefits into daily operations using task management. “Showing the store-level employee how their work impacts and benefits the organization—so they don’t feel like it is just another task or step they are required to do—is important to consistent adoption of any RFID program across a large retail chain. Decentralized operations require consistent processes and compliance to ensure data quality and ROI,” she explained. Read the full article, “RFID in Retail,” originally published in 2016, to discover the history of the technology and additional advice in implementing an RFID program. This excerpt was updated January 17, 2018.